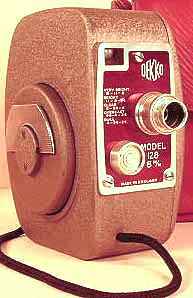 Dekko produced only three movie cameras: two utilizing a 9,5mm film and the third a 8mm film. The first was the Dekko Standard Model (it is mine), produced in 1934, equipped with a lens Taylor Hobson f:2,5 23mm. It weights kg. 1,200 and its measures are the following: 59x125x133. It has the housing of black bakelite. The second movie camera is the Dekko de Luxe Model 104, produced in 1934, it is equipped with a lens Dallmeyer Speed Anastigmat f:1,5 25mm, it weights kg. 1,450 and its measures are the following: 59x125x150. It has the housing of metal covered with black leather. There is a third movie camera, the Dekko Model 110, it used 8mm film, equipped with a lens National Optic Anastigmat f:2,5 12,5mm, with a housing of dark brown metal. The model 128 had a bad fortune: it was too similar in shape to other models produced by renowned brands. For these reasons there aren't few news about model 128. It was produced in 1950. It is equipped with a lens National Opt. co. f:2,5, 12,5mm. Its weights is kg. 0,900 and its measures are the following: 63x127x127. It had a bad fortune, but it has a good worth for the collectors.